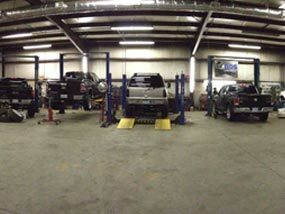 Here at Davis Offroad we pride ourselves on giving each vehicle the individual attention it deserves. Brain and Daniel Davis and Johnathan personally work on every vehicle that comes through the shop doors. Even with only three guys running the entire operation - our turnaround times are quicker than the industry standard and the quality is superior! Each truck, whether it’s getting a simple leveling kit or a one of a kind lift, gets the same level of quality work and attention to detail. If you are looking to have a lift or accessory installed please give us a shout or fill out the Request a Free Quote form below in advance so we can be sure to save you a spot on our schedule! When calling the shop – your call will most likely be answered by one of the three Davis’s. We do not have a secretary; it’s important to us at Davis Offroad that you are able to speak to the knowledgeable staff that work on your trucks and are able to guide you 100% in the direction you want to go. Due to the nature of our work we are sometimes unable to be reached on the phone, so please leave us a message - we will do our utmost to get back to you as soon as possible with all the information you need. You can rest assured that your install will be executed in a correct and timely fashion; we will not send any vehicle out of the door unless it is perfect. Davis Offroad averages between 12-15 trucks a week on installs of all kinds, most lifts are a 2 day process and we keep our schedule around 1-1.5 weeks ahead to ensure a good return time for you. We look forward to working with you on all your vehicle needs and thank you for your future business!